More Info Coming to a Pack Near You! The first time I ever tried soba noodles, what I really ended up with was a glue-like mess. I had seen the delicious looking package on the shelf and decided, “Yeah! I’m going to make that!” Of course what I did when I got home (finding no decipherable English instructions on the packet) was to stick them the whole packet in about 2cm of water (in a kettle no less) and forget about them boiling away until roughly half an hour after they had changed from scrumptious noodles to grey gloop. Seem familiar to anyone else? Well, fear no more! We at Japan Centre have been beavering away in the sticky label mines beefing up our on-pack labeling info. 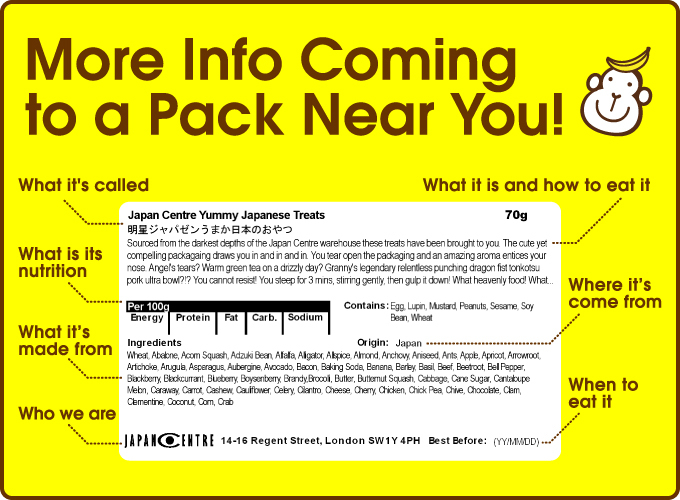 Over the last year we’ve been adding all kinds of cool features to the Japan Centre website, like recipes, cooking instructions and nutritional information, but now it’s the turn of the packaging too! So not only will you be able to find out about what your food is and how to eat it, we will also try to give a little bit of info about what it tastes like and where it came from even when you’re away from your computer. Here comes the high-tech sciency bit, check out our very cool labelly diagram! The Kit Kat aficionados amongst you might have already spotted something different on your delicious snacks already, but we will now be rolling these labels out to all products directly imported by Japan Centre! Yay! Posted in Stores. Bookmark the permalink. New labels look great! Will this also include info about whether the item is suitable for vegetarians or vegans? I spend a lot of time reading lists of ingredients looking for meat derived ingredients. Having an easy to find ‘V’ makes me an even happier monkey. Yes it will have clear indication of whether it contains meat or fish products to the right-hand side of the nutritional information.